Product #21579 | SKU PT86520 | 0.0 (no ratings yet) Thanks for your rating! 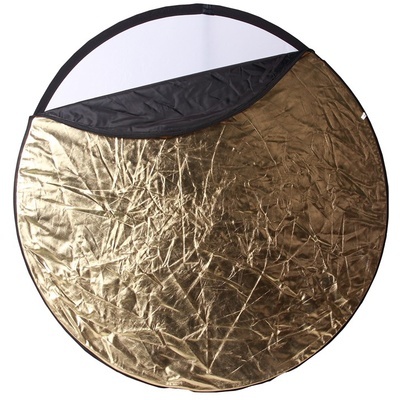 The Phottix 5 in 1 Light Multi Collapsible Reflector (42”) is an essential accessory. It can assist in creating a wide range of lighting effects and act as portable background. Five easy-to-change colour panels are included: Gold, Silver, White, Black, Translucent. Gold Bounce Panel – Provides a warm gold glow, excellent for portrait work. Silver Bounce Panel - Provides a high contrast reflective bounce, to increase highlights and contrast. White Bounce Panel - Creates a bright, natural second light for fill or creating highlights. Pure Black Absorption Panel – Absorbs light, does not reflect. Limit the sun or window light, hot spots or highlights. Translucent White Diffusion Panel - Designed to diffuse light in a similar fashion to a soft box, ideal for minimising shadows and softening light.